it’s strange to think that in most of the world it’s already the new year…here, we’ve still got about 4 hours to go. i don’t make new year’s resolutions, as a rule – i’ve never kept one, so there’s no point. i would however, like to finish quite a few wips/ufos in the coming months. my problem isn’t that i don’t like a project (usually) or get tired of it (usually) – i just become entranced by something new. new yarn, a new pattern. however, in this instance, i really really really need the gloves. or twisted stitch gauntlets, as the pattern calls them (ravelry link ). i’m using the classic elite one fifty i bought last week, and the first one has gone pretty well. i did frog part of the hand back when i decided it was going to be too long for me so i moved the thumb a bit higher. i just have two fingers left on this one and i can start the left hand. however…this means i’ve been neglecting my other knits. shamefully. maybe in this new year, just maybe, i can get some projects finished. 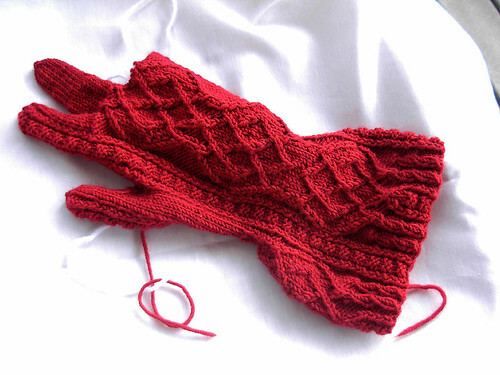 Just think, once the gloves are finished and your hands are toasty warm, you can get on with the other knits…right? I know exactly what you mean though.